January 26, 2015 -- Nueva Tribuna, translated by Revolting Europe posted at Links International Journal of Socialist Renewal -- In the wake of SYRIZA’s success in Greece, all eyes are on whether something similar is possible in Spain, where local and general elections are due later this year. For that to happen, the upstart party Podemos that is leading in the polls needs to drop its opposition to building a radical left coalition too. The situations are different, but also similar. Despite not suffering as much as Greece, we have also suffered austerity policies dictated by the Troika and the “diktat” of Angela Merkel [Germany]. Social inequalities have grown to unacceptable levels; cutbacks have reduced our welfare state in health, education and overall social spending; salaries and pensions have been reduced; unemployment has risen to 25%, hitting youth particular hard; poverty has soared etc. We sunk the citizens to save the banks. The credibility of right-wing parties and those that have pursued right-wing policies have bombed. On the right, the Popular Party (PP) and Catalonia’s Convergence and Union (CiU) are plagued by a corruption that has penetrated to the marrow of their bones. The social democrats (PSOE), are also affected, even if to a lesser extent, and are in a state of ideological confusion as a result of the neoliberal drift and the right-wing policies of their governments that have led to a sharp and sustained fall in their electoral prospects. The regime of imperfect bipartisanship seems doomed to die, as in Greece. And the populist alternative Podemos has exploded onto the scene, to the detriment of the [traditional] forces of the alternative left. But Podemos is not SYRIZA. SYRIZA is a political force with a clearly defined left alternative program. SYRIZA is not a product of an intellectual laboratory nor is it based on marketing communications; it is something else. SYRIZA has a long political history, is the result of a confluence of forces of the alternative left, eurocomunistas, environmentalists, ecosocialists, radical leftist groups who has travelled far along a political path together. SYRIZA has, though experience, done a great deal of political learning, from a minority opposition to the political alternative. Maturing its program. Practicing its politics in municipalities and regions, in opposition and in power. Until today, when it finally established itself as the force that will try to govern Greece from a new perspective. In our country there is no SYRIZA, and Podemos isn’t SYRIZA, neither by its history nor by maturity, nor by political practice. Its message is not a confluence or unity of forces that are alternative to Spain’s two alternating parties of power. It is exclusive, it is of “us alone”. Its discourse is arrogant, sectarian and it lacks subtlety. Yes, it has a very good command of language communication, is like a new product offered to the electoral consumer. Pablo Iglesias has said many times that Podemos is only interested in winning. He even said that he does not plan to spend four years in opposition. This position, lacking in politics, is what sets it apart from Alexis Tsipras, a politicians who takes one step at a time, learning from the defeats and the difficulties of everyday politics. Unfortunately Podemos has not so far opted for unity. At the last European election the sum of alternative Plural Left [led by Izquierda Unida, United Left – IU] forces, Podemos and Equo got as many votes as the PSOE. The confluence could enable an alternative that is plural, inspiring, and complete, some with experience others masters of new forms of communication. Unfortunately unity does not seem possible for now. It is possible we may miss a unique opportunity for political change. It is possible that the personal egos and arrogance of a few people will see us pass over a historic opportunity. It is possible that the lack of will ends by splitting forces that will enable the right to win again, and hope will be lost. We need our SYRIZA and we need it now. There have been embryonic attempts to build one. The existence of the Plural Left (IU, ICV, CHA, Anova, etc. ), the formation of AGE [Galician Left Alternative] in Galicia, the continued ICV-EUiA coalition in Catalonia are steps in this direction. The policy of political confluence of these forces is a difficult but positive path. Advancing alternative forces in unity, bringing together people like Equo or Plural, Compromís Space and if possible, Podemos is a necessary goal. In Barcelona, ahead of the local elections in May, an electoral coalition has been established that would act like an embryo of our SYRIZA. The coalition of Podemos, Guanyem, ICV, EuiA, Procés Constituyent and Equo is the proof that unity is possible, and that has to be done on the basis of all giving way, through political generosity, as has occurred in this case, and political will above all to make another form of politics that makes the citizenship a priority over everything, including party interests. In Spain, we don’t have our SYRIZA but we need it. It will take responsibility, generosity and loyalty, overcoming personalities and factions; everyone can contribute the positives they have to offer – organisational, political and personal – and leave behind the negatives. This is the only way alternative unity will be achieved. The rest is just playing with words. We cannot posit as opposites popular unity and left unity, because the left signifies the political expression of the majority of workers and the masses, i.e. the majority of people, of the citizens. Anything else is just a bid to differentiate oneself and will lead to the frustration of the hopes of citizens. It is the time of Alexis Tsipras and SYRIZA in Greece. 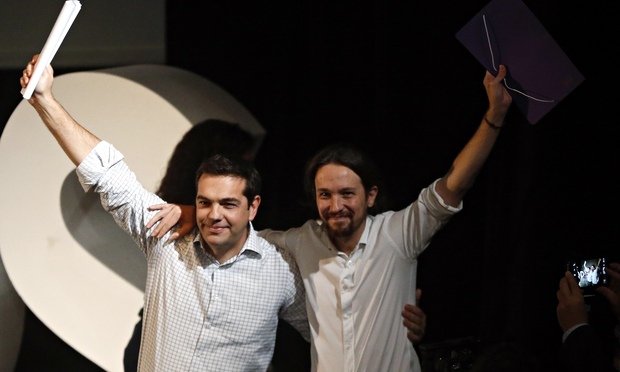 It’s also the time to build an alternative like SYRIZA here and now in Spain. It is time to cast aside egos and sterile sectarianism. We must not resign ourselves to lose once again.